Don’t you just love Pinterest? 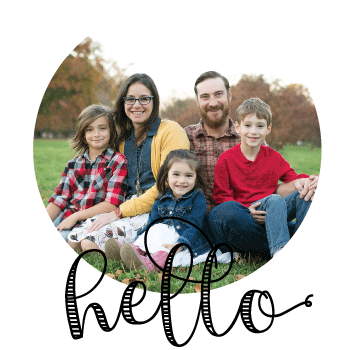 Its become my personal online cookbook where I’ve categorized hundreds of recipes into specific categories. Recently, I’ve started seeing many coleslaw recipes running through my feed that had me craving for some cold, creamy, and crunchy delight. 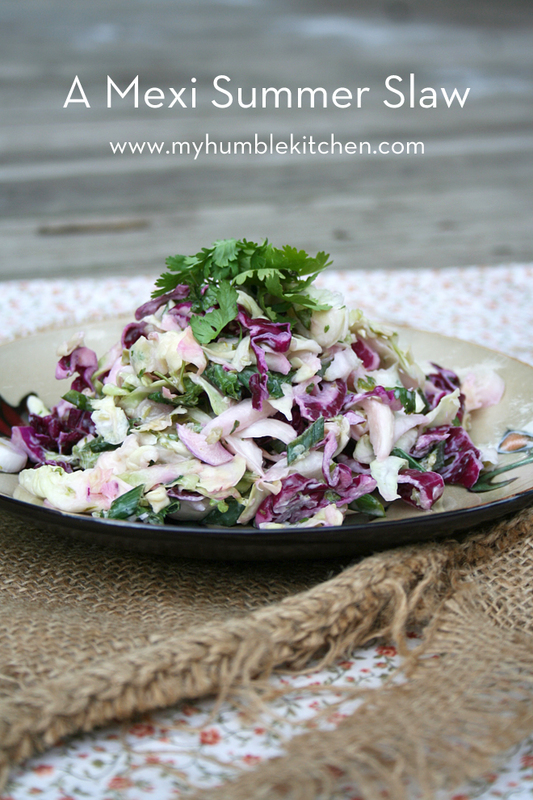 I often like to spice my salads up that’s exactly what I did for this Mexican summer coleslaw. This coleslaw doesn’t have a sweetener added. Instead, it’s spiced up with fresh from the garden green onions, cilantro, and freshly chopped jalapeno. It does have a bit of a kick so feel free to add or omit the jalapeno to your family’s liking. Since it did have too much of a kick for Big and Little brother, I made them a tomato and cucumber salad marinated in a red wine vinaigrette. Delicious just the same. 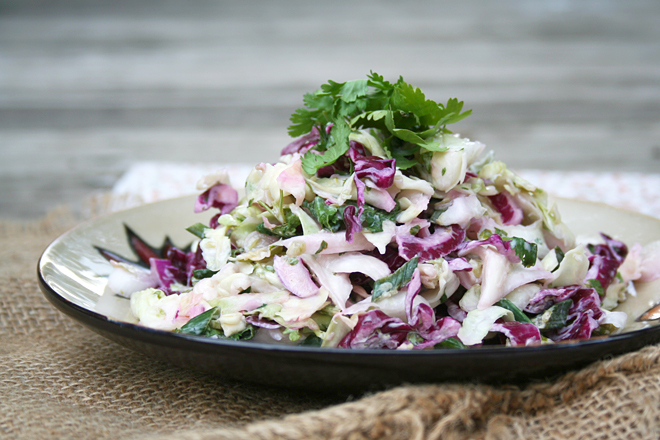 A spiced up summer coleslaw perfect for your next outdoor barbecue or potluck. Do you love summer salads as much as I do? Please share what your favorite summer salad is in the comments below. I love summer and all the fresh salad options too! Just started getting delicious homegrown tomatoes. Hoping for cucumbers soon. But to answer your question, here’s a few favorites: Mango salsa served with Salmon, Tsiky served with steak or shishkabobs. Green salads can be topped to make it International – Taco Salad, Anitpasto Salad, Greek Salad… or just a nice basic Ceasar with a grilled chicken breast. Last week, I added some nectarines, tomatoes, cucumbers, pepperjack cheese, and olives and served with a roasted turkey breast (also planned to use for lunch meat). Thankyou for sharing all your ideas as well. You inspire be to continue being creative with what is in season, even though I’m only feeding 2. Diana, this looks awesome! I love cold, crunchy, hearty salads. This was a winner, for sure! I rarely go on Pinterest because I barely have time to check my email, but what a great idea to have it “feed” you recipes for veggies in your garden! Thanks to you, I started a Square Foot Garden last fall and it’s been doing pretty well. Now I have an abundance of some things and can’t figure out what to do with it all.